Check if the wireless adapter’s Power LED, found on the device itself, is lit. NOTE: The location of the LED depends on the model of your adapter. 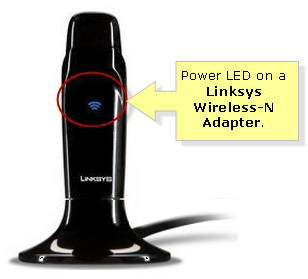 NOTE: If the LEDs on your Linksys wireless adapter are not lit, it’s possible that the device is not properly connected to the port or slot. For instructions on how to properly connect your adapter to the computer’s USB port or PCI/PCMCIA slot, click here. An improper or incomplete installation of the driver is a common cause for the WLAN monitor to report the Adapter is Inactive error. Check if the Linksys adapter drivers were properly installed, through your computer’s Device Manager. You can follow the instructions on how to check for adapter device errors by clicking here. 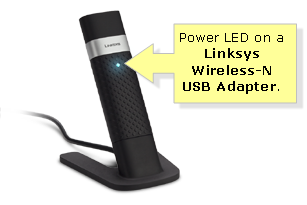 You may also check the Linksys Support Site if there is an updated driver for your adapter. For instructions on how to do this, click here. Inserting the adapter to another USB port or PCI/PCMCIA is recommended if the first port or slot rendered an inactive wireless network adapter status. This is to further isolate the problem. If the same issue persists, trying another computer is advised. 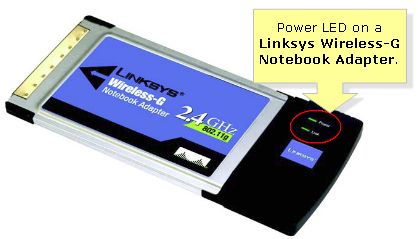 Linksys wireless adapters are only compatible to work with Windows-based computers. Checking the compatibility of the adapter’s driver with your computer’s operating system (OS) is also important to ensure that it will work. Older adapter models may not work with the new Windows OS versions (7 and 8) and vice versa. NOTE: You can also check the adapter’s compatibility on the Linksys Support Site’s release notes under the product’s downloads section.